The Bundt pan is a crown-shaped bakeware item specially designed to accommodate a bundt cake like the french Savarin, the german Kugelhupf, the yummy Angel Food Cake or simply a pound cake. It can be made of non-stick metal steel or silicone so to facilitate the baking and unmolding of the cake. There is no real specific cake recipe associated to the Bundt cakes. However the also written Kugelhopf which was originally made in this type of mold is a crumbly cake garnished with rum soaked raisins and sprinkled with icing sugar. The delicacy is usually served at tea time. It is also often appreciated with a fruity eau-de-vie. Which bundt cake recipe to bake in this cake pan? A Kugelhuf or a Rum Baba of course, but also all the cakes to which we want to give a pretty crown shape and the list is long: Paris Brest, spice cake, marble cake, chocolate cake Strawberry Charlotte, carrot cake, Christmas wreath, brioche, cheesecake, monkey bread. If there is one bundt cake recipe which embodies the festive spirit it is certainly the rum baba cake. was invented by pastrycake chef Nicolas Stohrer who worked for King Stanislaus, a former Polish King who was exiled to France. To please king Stanislas who was nostalgic of his country but especially Polish pastries, the baker would have made a kind of Kugelhuf that he would have soaked with wine to prevent the cake is too dry. Legend has it that King Stanislaus named this pastry as a tribute to the One Thousand and One Nights night character Ali Baba. Later in 1725, Nicolas Stohrer improved the recipe for the baba by replacing the Tokaji wine-based alcoholic syrup with a rum-flavored syrup and opened a pastry shop in Paris. The famous Rum Baba was born. Did you know that the French have developed their own Rum Baba cake named the Savarin? The Savarin cake was invented by the Julien brothers in Savarin in 1844. The savarin dough is similar to the baba dough (a leavened dough). The big difference is the soaking syrup, we replace the rum with Kirsch. It is also customary not to add raisins in savarin. The name of this pastry comes from the famous French writer and gastronomist Jean Anthelme Brillat-Savarin who has unveiled the secret of the recipe for kirsch soaking syrup to one of the Julien brothers. In summary, the dough is the same but the soaking syrup and filling and therefore the final cake different. How to prepare savarin / baba dough? Savarin dough or baba dough is an art that professional cooks and pastry chefs need to master nowadays. Without going into the details of the recipe for the dough, we can say that the secret of success lies in the rest time left to the dough for it to rise. How to make a baba cake or a savarin? To make a savarin or a baba cake, you will then need to garnish your molds with a piping bag, bake and unmold your savarins to finish by pilling. You will need to soak your savarin dough as you soak a biscuit or sponge cake with a syrup (water and sugar) alcoholic and flavored (rum, kirsch or without alcohol depending on your preferences). It will be done to absorb the cooked dough a specific amount of liquid to make it soft, to prolong its conservation and to avoid drying out the dough. The last step will be to glaze and garnish your cakes with whipped cream, and to decorate it with fresh fruit, dried fruits (pecans for example) or candied fruits. The topping remains a decisive step in the recipe that will delight pastries lovers. 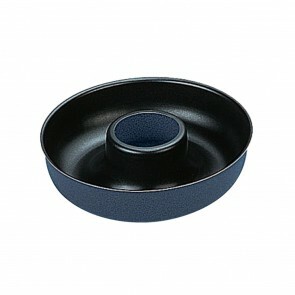 Mini bundt pan, stainless steel pan: choosing the perfect bundt cake pan for your savarin, Kugelhupf and baba rhum cake! We have a broad selection bundt pans on our website and here are some tips to help you choose the perfect baking pan? 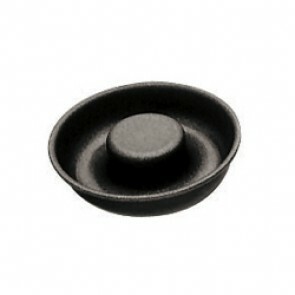 The savarin metal mold with non stick coating is very light, large, and it does not require you to grease and flour your mold and get a uniform baking. The non-stick mold has the advantage of being dishwasher safe. 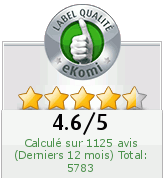 However, it may lose its nonstick quality over time and demolding will be less easy. The silicone mold is also flexible, lightweight, unbreakable, allows easy demolding and is dishwasher safe. Its great advantage is that it can be multifaceted. 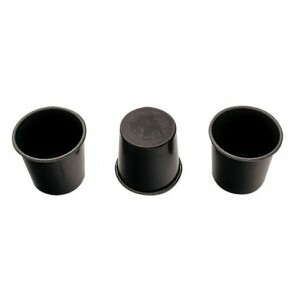 Thus, you will find flexipan mini bundt pans for individual baba molds in our selection. By cons, its flexibility can become a disadvantage over time, the silicone mold tends to become greasy and clean less easily. It is up to you to consider the advantages and disadvantages of each material and make your choice among our wide selection of savarin or baba molds according to the use you want to make. Note that there is a special mold for the Italian baba: the babà "Neapolitan" that can be soaked with rum or limoncello, in fact it is prepared in a small cylindrical mold with high rim very similar to muffin pans. Why not give their former glory to yesteryear pastry with a modern twist like the rum baba or savarin for your next birthday cake, it will change from the traditional dark chocolate cake, layer cake, apple cake or pound cakes! Put on your kitchen aprons and while not complete your bakeware sets for all your appetizers, cakes, and pastries: you will find all the baking tools you need in our online kitchen supply where you will find professional-quality molds such as loaf pan for your banana bread or meatloaf, brioche mold, silicone baking molds, parchment paper, pudding pan, fluted mold, cooling rack, ring mold, rolling pins, flexipan food silicone molds, sponge cake mold, baking sheet or round cake pan and many other kitchen utensils in all materials, in different formats and colors. And satiate your baking passion with our cake decorating supplies with Az Boutique. 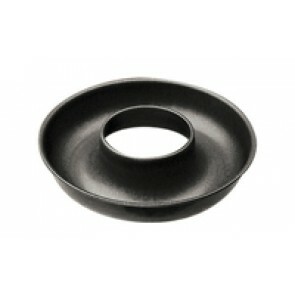 Non-stick rum baba mold 26cm/10"